The Complete Solutions services that we provide are primary focused on .NET development, Business Intelligence and Reporting projects in which we have unique know-how. As part of the service, we can deliver all project phases needed for a successful solution including: requirements analysis, design, development and maintenance. Sometimes ready-made solutions cannot comply with all your requirements. You can end up wasting valuable time testing numerous Business Intelligence applications and never finding the set of features you need. Luckily, we already have the components that can do most of the hard work. This allows us to quickly develop custom and branded digital dashboards for a variety of platforms such as Windows, Mac or even Cross-Platform. Nowadays more and more information needs to be available on Mobile devices. The best way to display such information is by custom Dashboards that are implemented as Native Apps. Native Apps development however can be quite expensive, especially when you target both iOS and Android devices. We at Nevron Consulting are here to help you get your Mobile Dashboards on budget and on time. This is possible because of our unique approach to mobile development that is based on .NET productivity and ready-made mobile components. We can build mobile dashboards for Android, iOS or Cross-Platform. When you need to visualize information that can be accessed by virtually everyone, you need to have a Web Dashboard. The Web Dashboards that we develop can be integrated into any .NET-based website and provide your users with advanced HTML5 features. 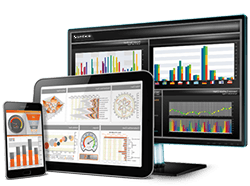 Nevron Consulting can offer great prices and short development time of all types of Web Dashboards that are using the products inside the Nevron Vision for .NET product line. We are the solo vendor of Cross-Platform .NET components. 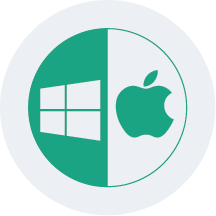 If you want to be simultaneously on the Windows and Mac markets than you have to trust us - we are your only option. Nowadays more and more companies understand the significance of being able to code-once and distribute to multiple Operating Systems and Environments. Although many see the Web as the only possible solution, we disagree. At its current stage the HTML5 technology can hardly compete in flexibility, performance and features with native applications. We at Nevron believe the future is in the development of Cross-Platform applications from a single code base. Be the first to follow this emerging trend and free yourself from the specific OS to which you are tied. Write Once - Deploy on Windows and Mac from a single code-base.